"Cisco" redirects here. For other uses, see Cisco (disambiguation). Not to be confused with Sysco. Cisco Systems, Inc. is an American multinational technology conglomerate headquartered in San Jose, California, in the center of Silicon Valley. Cisco develops, manufactures and sells networking hardware, telecommunications equipment and other high-technology services and products. Through its numerous acquired subsidiaries, such as OpenDNS, WebEx, Jabber and Jasper, Cisco specializes into specific tech markets, such as Internet of Things (IoT), domain security and energy management. Cisco Systems was founded in December 1984 by Leonard Bosack and Sandy Lerner, two Stanford University computer scientists. They pioneered the concept of a local area network (LAN) being used to connect geographically disparate computers over a multiprotocol router system. By the time the company went public in 1990, Cisco had a market capitalization of $224 million. By the end of the dot-com bubble in the year 2000, Cisco had a more than $500 billion market capitalization. Cisco Systems was founded in December 1984 by Sandy Lerner, a director of computer facilities for the Stanford University Graduate School of Business. Lerner partnered with her husband, Leonard Bosack, who was in charge of the Stanford University computer science department's computers. Cisco's initial product has roots in Stanford University's campus technology. In the early 1980's students and staff at Stanford; including Bosack, used technology on the campus to link all of the school's computer systems to talk to one another, creating a box that functioned as a multiprotocol router called the "Blue Box." The Blue Box used software that was originally written at Stanford by research engineer William Yeager. In 1985, Bosack and Stanford employee Kirk Lougheed began a project to formally network Stanford's campus. They adapted Yeager's software into what became the foundation for Cisco IOS, despite Yeager's claims that he had been denied permission to sell the Blue Box commercially. On July 11, 1986, Bosack and Lougheed were forced to resign from Stanford and the university contemplated filing criminal complaints against Cisco and its founders for the theft of its software, hardware designs, and other intellectual properties. In 1987, Stanford licensed the router software and two computer boards to Cisco. In addition to Bosack, Lerner, Lougheed, Greg Satz (a programmer), and Richard Troiano (who handled sales), completed the early Cisco team. The company's first CEO was Bill Graves, who held the position from 1987 to 1988. In 1988, John Morgridge was appointed CEO. The name "Cisco" was derived from the city name San Francisco, which is why the company's engineers insisted on using the lower case "cisco" in its early years. The logo is intended to depict the two towers of the Golden Gate Bridge. On February 16, 1990, Cisco Systems went public with a market capitalization of $224 million, and was listed on the NASDAQ stock exchange. On August 28, 1990, Lerner was fired. Upon hearing the news, her husband Bosack resigned in protest. The couple walked away from Cisco with $170 million, 70% of which was committed to their own charity. Although Cisco was not the first company to develop and sell dedicated network nodes, it was one of the first to sell commercially successful routers supporting multiple network protocols. Classical, CPU-based architecture of early Cisco devices coupled with flexibility of operating system IOS allowed for keeping up with evolving technology needs by means of frequent software upgrades. Some popular models of that time (such as Cisco 2500) managed to stay in production for almost a decade virtually unchanged. The company was quick to capture the emerging service provider environment, entering the SP market with product lines such as Cisco 7000 and Cisco 8500. Between 1992 and 1994, Cisco acquired several companies in Ethernet switching, such as Kalpana, Grand Junction and most notably, Mario Mazzola's Crescendo Communications, which together formed the Catalyst business unit. At the time, the company envisioned layer 3 routing and layer 2 (Ethernet, Token Ring) switching as complementary functions of different intelligence and architecture—the former was slow and complex, the latter was fast but simple. This philosophy dominated the company's product lines throughout the 1990s. 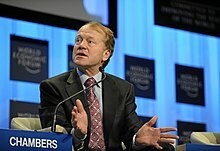 John T. Chambers led Cisco as its CEO between 1995 and 2015. (Pictured at 2010 World Economic Forum, in Davos, Switzerland). The Internet Protocol (IP) became widely adopted in the mid-to-late 1990s. Cisco introduced products ranging from modem access shelves (AS5200) to core GSR routers, making them a major player in the market. In late March 2000, at the height of the dot-com bubble, Cisco became the most valuable company in the world, with a market capitalization of more than $500 billion. As of July 2014, with a market cap of about US$129 billion, it was still one of the most valuable companies. The perceived complexity of programming routing functions in silicon led to the formation of several startups determined to find new ways to process IP and MPLS packets entirely in hardware and blur boundaries between routing and switching. One of them, Juniper Networks, shipped their first product in 1999 and by 2000 chipped away about 30% from Cisco SP Market share. In response, Cisco later developed homegrown ASICs and fast processing cards for GSR routers and Catalyst 6500 switches. In 2004, Cisco also started migration to new high-end hardware CRS-1 and software architecture IOS-XR. Russian President Dmitry Medvedev and California Gov. Arnold Schwarzenegger at Cisco, 2010. As part of a rebranding campaign in 2006, Cisco Systems adopted the shortened name "Cisco" and created "The Human Network" advertising campaign. These efforts were meant to make Cisco a "household" brand—a strategy designed to support the low-end Linksys products and future consumer products. On the more traditional business side, Cisco continued to develop its routing, switching and security portfolio. The quickly growing importance of Ethernet also influenced the company's product lines. Limits of IOS and aging Crescendo architecture also forced Cisco to look at merchant silicon in the carrier Ethernet segment. This resulted in a new ASR9000 product family intended to consolidate the company's carrier ethernet and subscriber management business around EZChip-based hardware and IOS-XR. Throughout the mid-2000s, Cisco also built a significant presence in India, establishing its Globalization Centre East in Bangalore for $1 billion. Cisco also expanded into new markets by acquisition—one example being a 2009 purchase of mobile specialist Starent Networks. Cisco continued to be challenged by both domestic Alcatel-Lucent, Juniper Networks and overseas competitors Huawei. Due to lower-than-expected profit in 2011, Cisco reduced annual expenses by $1 billion. The company cut around 3,000 employees with an early-retirement program who accepted buyout and planned to eliminate as many as 10,000 jobs (around 14 percent of the 73,400 total employees before curtailment). During the 2011 analyst call, Cisco's CEO John Chambers called out several competitors by name, including Juniper and HP. On July 24, 2012, Cisco received approval from the EU to acquire NDS (a TV software developer) for US$5 billion. In 2013, Cisco sold its Linksys home-router unit to Belkin International Inc., signaling a shift to sales to businesses rather than consumers. 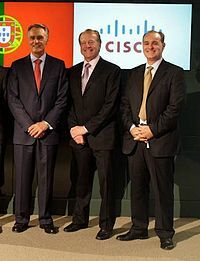 Former Portuguese President Cavaco Silva, former Cisco CEO John Chambers and Cisco Senior Director of Innovation Helder Antunes, during the 2011 presidential visit to the US. On July 23, 2013, Cisco Systems announced a definitive agreement to acquire Sourcefire for $2.7 billion. On August 14, 2013, Cisco Systems announced it would cut 4,000 jobs from its workforce, which was roughly 6%, starting in 2014. At the end of 2013, Cisco announced poor revenue due to depressed sales in emerging markets, caused by economic uncertainty and by fears of the National Security Agency planting backdoors in its products. In April 2014, Cisco announced funding for early-stage firms to focus on the Internet of Things. The investment fund was allocated to investments in IoT accelerators and startups such as The Alchemist Accelerator, Ayla Networks and EVRYTHNG. Later that year, the company announced it was laying off another 6,000 workers or 8% of its global workforce, as part of a second restructuring. On November 4, 2014, Cisco announced an investment in Stratoscale. On May 4, 2015, Cisco announced CEO and Chairman John Chambers would step down as CEO on July 26, 2015, but remain chairman. Chuck Robbins, senior vice president of worldwide sales & operations and 17-year Cisco veteran, was announced as the next CEO. On July 23, 2015, Cisco announced the divesture of its television set-top-box and cable modem business to Technicolor SA for $600 million, a division originally formed by Cisco's $6.9 billion purchase of Scientific Atlanta. The deal came as part of Cisco's gradual exit from the consumer market, and as part of an effort by Cisco's new leadership to focus on cloud-based products in enterprise segments. Cisco indicated that it would still collaborate with Technicolor on video products. On November 19, 2015, Cisco, alongside ARM Holdings, Dell, Intel, Microsoft and Princeton University, founded the OpenFog Consortium, to promote interests and development in fog computing. In January 2016, Cisco invested in VeloCloud, a software-defined WAN (SD-WAN) start-up with a cloud offering for configuring and optimizing branch office networks. Cisco contributed to VeloCloud's $27 million Series C round, led by March Capital Partners. In February 2017, Cisco launched a cloud-based secure internet gateway, called Cisco Umbrella, to provide safe internet access to users who don't use their corporate networks or VPNs to connect to remote data centers. Immediately after reporting their fourth quarter earnings for 2017, Cisco's price-per-share value jumped by over 7%, while its Earnings per share Ratio increased from 60 to 61 cents per share, due in part to Cisco's outperformance of analyst expectations. In September 2017, Chambers announced that he would step down from the executive chairman role at the end of his term on the board in December 2017. On December 11, 2017, Robbins was elected to succeed Chambers as executive chairman while retaining his role as CEO, and Chambers was given the title of "Chairman Emeritus." Reuters reported that "Cisco Systems Inc’s (CSCO.O) product revenue in Russia grew 20 percent in 2017, ahead of Cisco’s technology product revenue growth in the other so-called BRIC countries of Brazil, China and India." On May 1, 2018, Cisco Systems agreed to buy AI-driven business intelligence startup Accompany for $270 million. As of June 2018, Cisco Systems ranked 444th on Forbes Global 2000 list, with $221.3 billion market cap. For the fiscal year 2017, Cisco reported earnings of US$0.1 billion, with an annual revenue of US$49.3 billion, an increase of 2.8% over the previous fiscal cycle. Cisco's shares traded at over $43 per share, and its market capitalization was valued at US$213.2 billion in September 2018. Low Net Income for fiscal year 2018 was attributed to a one time tax charge, that allowed Cisco to bring back capital from overseas. Cisco used this money it was able to bring back at a lower tax rate to fund share buybacks and acquisitions. CloudLock, a Cisco cloud computing security subsidiary. Cisco acquired a variety of companies to spin products and talent into the company. In 1995–1996 the company completed 11 acquisitions. Several acquisitions, such as Stratacom, were the biggest deals in the industry when they occurred. During the Internet boom in 1999, the company acquired Cerent Corporation, a start-up company located in Petaluma, California, for about US$7 billion. It was the most expensive acquisition made by Cisco to that date, and only the acquisition of Scientific Atlanta has been larger. In 1999 Cisco also acquired stake for $1 Billion in KPMG Consulting to enable establishing Internet firm Metrius founded by Keyur Patel of Fuse. Several acquired companies have grown into $1Bn+ business units for Cisco, including LAN switching, Enterprise Voice over Internet Protocol (VOIP) platform Webex and home networking. The latter came as result of Cisco acquiring Linksys in 2003 and in 2010 was supplemented with new product line dubbed Cisco Valet. Cisco announced on January 12, 2005, that it would acquire Airespace for US$450 million to reinforce the wireless controller product lines. Cisco announced on January 4, 2007, that it would buy IronPort in a deal valued at US$830 millionand completed the acquisition on June 25, 2007. IronPort was best known for its IronPort AntiSpam, its SenderBase email reputation service and its email security appliances. Accordingly, IronPort was integrated into the Cisco Security business unit.Ironport's Senderbase was renamed as Sensorbase to take account of the input into this database that other Cisco devices provide. SensorBase allows these devices to build a risk profile on IP addresses, therefore allowing risk profiles to be dynamically created on http sites and SMTP email sources. Cisco announced on March 15, 2012, that it would acquire NDS Group for $5bn. The transaction was completed on July 30, 2012. In more recent merger deals, Cisco bought Starent Networks (a mobile packet core company) and Moto Development Group, a product design consulting firm that helped develop Cisco's Flip video camera. Also in 2010, Cisco became a key stakeholder in e-Skills Week. In March 2011, Cisco completed the acquisition of privately held network configuration and change management software company Pari Networks. Although many buy-ins (such as Crescendo Networks in 1993, Tandberg in 2010) resulted in acquisition of flagship technology to Cisco, many others have failed—partially or completely. For instance, in 2010 Cisco occupied a meaningful share of the packet-optical market, revenues were still not on par with US$7 billion price tag paid in 1999 for Cerent. Some of acquired technologies (such as Flip from Pure Digital) saw their product lines terminated. Cisco campuses in (top to bottom) Bangalore, India, Munich, Germany and Oslo, Norway. January 2013, Cisco Systems acquired Israeli software maker Intucell for around $475 million in cash, a move to expand its mobile network management offerings. In the same month, Cisco Systems acquired Cognitive Security, a company focused on Cyber Threat Protection. Cisco also acquired SolveDirect (cloud services) in March 2013 and Ubiquisys (mobile software) in April 2013. Cisco acquired cyber-security firm Sourcefire, in October 2013. On June 16, 2014, Cisco announced that it has completed the acquisition of ThreatGRID, a company that provided dynamic malware analysis and threat intelligence technology. June 17, 2014, Cisco announced its intent to acquire privately held Tail-f Systems, a leader in multi-vendor network service orchestration solutions for traditional and virtualized networks. April 2, 2015, Cisco announced plans to buy Embrane, a software-defined networking startup. The deal will give Cisco Embrane's software platform, which provides layer 3–7 network services for things such as firewalls, VPN termination, server load balancers and SSL offload. May 7, 2015 Cisco announced plans to buy Tropo, a cloud API platform that simplifies the addition of real-time communications and collaboration capabilities within applications. June 30, 2015, Cisco acquired privately held OpenDNS, the company best known for its DNS service that adds a level of security by monitoring domain name requests. August 6, 2015, Cisco announced that it has completed the acquisition of privately held MaintenanceNet, the US-based company best known for its cloud-based contract management platform ServiceExchange. On the same month, Cisco acquired Pawaa, a privately held company in Bangalore, India that provides secure on-premises and cloud-based file-sharing software. September 30, 2015, Cisco announced its intent to acquire privately held Portcullis Computer Security, a UK-based company that provides cybersecurity services to enterprise clients and the government sectors. October 26, 2015, Cisco announced its intent to acquire ParStream, a privately held company based in Cologne, Germany, that provides an analytics database that allows companies to analyze large amounts of data and store it in near real time anywhere in the network. October 27, 2015, Cisco announced that it would acquire Lancope, a company that focuses on detecting threat activity, for $452.5 million in a cash-and-equity deal. June 28, 2016, Cisco announced its intent to acquire CloudLock, a privately held cloud security company founded in 2011 by three Israeli military veterans, for $293 million. The deal was expected to close in the first quarter of 2017. In August 2016, Cisco announced it is getting closer to making a deal to acquire Springpath, the startup whose technology is used in Cisco's HyperFlex Systems. Cisco already owns an undisclosed stake in the hyper-converged provider. January 2017, Cisco announced they would acquire AppDynamics, a company that monitors application performance, for $3.7 billion. The acquisition came just one day before AppDynamics was set to IPO. January 26, 2017, Cisco founded the Innovation Alliance in Germany with eleven other companies bringing together 40 sites and 2,000 staff to provide small businesses in Germany with expertise. August 1, 2017 Cisco completed the acquisition of Viptela Inc. for $610 million in cash and assumed equity awards. Viptela is a privately held software-defined wide area network (SD-WAN) company based in San Jose, Ca. October 23, 2017 Cisco Systems announced it would be acquiring Broadsoft for $1.9 Billion to further entrench itself in the cloud communication and collaboration area. Cisco SG300-28 Rackmount switch (top) and Cisco EPC-3010 modem (bottom). Cisco's products and services focus upon three market segments—enterprise, service provider, midsize and small business. Cisco has grown increasingly popular in the Asia-Pacific region over the last three decades[when?] and is the dominant vendor in the Australian market with leadership across all market segments. It uses its Australian office as one of the main headquarters for the Asia-Pacific region, offering a diverse product portfolio for long-term stability, and integration is a sustainable competitive advantage. Cisco became a major provider of Voice over IP to enterprises and is now moving into the home user market through its acquisitions of Scientific Atlanta and Linksys. Scientific Atlanta provides VoIP equipment to cable service providers such as Time Warner, Cablevision, Rogers Communications, UPC and others; Linksys has partnered with companies such as Skype, Microsoft and Yahoo! to integrate consumer VoIP services with wireless and cordless phones. Cisco partners can offer cloud-based services based on Cisco's virtualized Unified Computing System (UCS). A part of the Cisco Unified Services Delivery Solution that includes hosted versions of Cisco Unified Communications Manager (UCM), Cisco Unified Contact Center, Cisco Unified Mobility, Cisco Unified Presence, Cisco Unity Connection (unified messaging) and Cisco Webex Meeting Center. As part of its Tactical Operations initiative, Cisco maintains several Network Emergency Response Vehicles (NERV)s. The vehicles are maintained and deployed by Cisco employees during natural disasters and other public crises. The vehicles are self-contained and provide wired and wireless services including voice and radio interoperability, voice over IP, network-based video surveillance and secured high-definition video-conferencing for leaders and first responders in crisis areas with up to 3 Mbit/s of bandwidth (up and down) via a 1.8-meter satellite antenna. NERVs are based at Cisco headquarters sites in San Jose, California and at Research Triangle Park, North Carolina, allowing strategic deployment in North America. They can become fully operational within 15 minutes of arrival. High-capacity diesel fuel-tanks allow the largest vehicles to run for up to 72 hours continuously. The NERV has been deployed to incidents such as the October 2007 California wildfires; hurricanes Gustav, Ike and Katrina; the 2010 San Bruno gas pipeline explosion, tornado outbreaks in North Carolina and Alabama in 2011; and Hurricane Sandy in 2012. The Tactical Operations team maintains and deploys smaller, more portable communication kits to emergencies outside of North America. In 2010, the team deployed to assist in earthquake recovery in Haiti and in Christchurch (New Zealand). In 2011, they deployed to flooding in Brazil, as well as in response to the 2011 earthquake and tsunami in Japan. In 2011, Cisco received the Innovation Preparedness award from the American Red Cross Silicon Valley Chapter for its development and use of these vehicles in disasters. Cisco headquarters in the North San Jose Innovation District, San Jose, California in Silicon Valley. Cisco Systems also sponsors a line of IT professional certifications for Cisco products. There are four or five(path to network designers) levels of certification: Entry (CCENT), Associate (CCNA/CCDA), Professional (CCNP/CCDP), Expert (CCIE/CCDE) and recently Architect(CCAr: CCDE previous), as well as nine different paths, Routing & Switching, Design, Industrial Network, Network Security, Service Provider, Service Provider Operations, Storage Networking, Voice, Datacenter and Wireless. A number of specialist technician, sales and datacenter certifications are also available. Cisco also provides training for these certifications via a portal called the Cisco Networking Academy. Qualifying schools can become members of the Cisco Networking Academy and then provide CCNA level or other level courses. Cisco Academy Instructors must be CCNA certified to be a CCAI certified instructor. Cisco often finds itself involved with technical education. With over 10,000 partnerships in over 65 countries Cisco Academy program operates in many exotic locations. For example, in March 2013, Cisco announced its interest in Myanmar by investing in two Cisco Networking Academies in Yangon and Mandalay and a channel partner network. In 2010, Secretary of State Hillary Clinton awarded Cisco the Secretary of State's Award for Corporate Excellence, which was presented in Jerusalem by Ambassador James B. Cunningham to Cisco Senior Manager Zika Abzuk. Cisco products, including IP phones and Telepresence, have been seen in movies and TV series. The company was featured in the documentary film Something Ventured which premiered in 2011. Cisco was a 2002–03 recipient of the Ron Brown Award, a U.S. presidential honor to recognize companies "for the exemplary quality of their relationships with employees and communities". Cisco has been included as part of Fortune's "100 Best Companies to Work For", ranking No. 20 in 2011. According to a report by technology consulting firm LexInnova, Cisco was one of the leading recipients of network security-related patents with the largest portfolio within other companies (6,442 security-related patents) in 2015. Cisco Live 2007 in Anaheim, California. Cisco Live is the company's annual exposition and conference. A class action lawsuit filed on April 20, 2001, accused Cisco of making misleading statements that "were relied on by purchasers of Cisco stock" and of insider trading. While Cisco denied all allegations in the suit, on August 18, 2006, Cisco's liability insurers, its directors and officers paid the plaintiffs US$91.75 million to settle the suit. On December 11, 2008, the Free Software Foundation filed suit against Cisco regarding Cisco's failure to comply with the GPL and LGPL license models and make the applicable source code publicly available. On May 20, 2009, Cisco settled this lawsuit by complying with FSF licensing terms and making a monetary contribution to the FSF. Cisco has been criticized for its involvement in censorship in the People's Republic of China. According to author Ethan Gutmann, Cisco and other telecommunications equipment providers supplied the Chinese government with surveillance and Internet infrastructure equipment that is used to block Internet websites and track online activities in China. Cisco has stated that it does not customize or develop specialized or unique filtering capabilities to enable governments to block access to information and that it sells the same equipment in China as it sells worldwide. Wired News had uncovered a leaked, confidential Cisco PowerPoint presentation that detailed the commercial opportunities of the Golden Shield Project of Internet control. In May 2011, a group of Falun Gong practitioners filed a lawsuit under the Alien Tort Statute alleging that Cisco knowingly developed and customized its product to assist the Chinese government in prosecution and abuse of Falun Gong practitioners. The lawsuit was dismissed in September 2014 by the United States District Court for the Northern District of California, which decision was appealed to United States Court of Appeals for the Ninth Circuit in September 2015. In October 2007, employees of Cisco's Brazilian unit were arrested on charges that they had imported equipment without paying import duties. In response, Cisco stated that they do not import directly into Brazil, and instead use middlemen. On December 1, 2008, Multiven filed an antitrust lawsuit against Cisco Systems, Inc. Multiven's complaint alleges that Cisco harmed Multiven and consumers by bundling and tying bug fixes/patches and updates for its operating system software to its maintenance services (SMARTnet). In May 2010, Cisco accused the person who filed the antitrust suit, British-Nigerian technology entrepreneur Peter Alfred-Adekeye, with hacking and pressured the US government to extradite him from Canada. Cisco settled the antitrust lawsuit two months after Alfred-Adekeye's arrest by making its software updates available to all Multiven customers. Cisco's Linksys E2700, E3500, E4500 devices have been reported to be remotely updated to a firmware version that forces users to register for a cloud service, allows Cisco to monitor their network use and ultimately shut down the cloud service account and thus render the affected router unusable. According to the German magazine Der Spiegel the NSA has developed JETPLOW for gaining access to ASA (series 5505, 5510, 5520, 5540 and 5550) and 500-series PIX Firewalls. Cisco's Chief Security Officer addressed the allegations publicly and denied working with any government to weaken Cisco products for exploitation or to implement security back doors. Cisco denied the allegations in a customer document saying that no information was included about specific Cisco products, supply chain intervention or implant techniques, or new security vulnerabilities. Cisco's general counsel also said that Cisco does not work with any government, including the United States Government, to weaken its products. The allegations are reported to have prompted the company's CEO to express concern to the President of the United States. In March 2014 Cisco Systems was sued for patent infringement. Spherix says that over $43 billion of Cisco's sales infringe on old Nortel patents owned by Spherix. Officials with Spherix are saying that a wide range of Cisco products, from switches to routers, infringe on 11 former Nortel patents that the company now owns. In January 2008, Cisco announced an investment of $10 million over three years towards job creation and technology sector development in the Palestinian Territories. According to Cisco, this project was in cooperation with Palestinian Authority President Mahmoud Abbas. Ramallah-based Exalt Technologies handles the software development that Cisco outsources to the Palestinian Territories. ^ "Contact Cisco". Retrieved March 1, 2017. ^ a b c d e f "Cisco Systems, Inc. 2018 Annual Report Form (10-K)" (PDF). U.S. Securities and Exchange Commission. August 2018. Retrieved April 1, 2018. ^ "Cisco, Form 10-K, Annual Report, Filing Date Sep 12, 2012" (PDF). secdatabase.com. Retrieved March 25, 2013. ^ Browning, E.S. (June 1, 2009). "Travelers, Cisco Replace Citi, GM in Dow". Wall Street Journal. Dow Jones & Company, Inc. Retrieved June 2, 2009. ^ a b "Cisco pushes past Microsoft in market value". CBS Marketwatch. March 25, 2000. Retrieved January 25, 2007. ^ Toscano, Paul (April 17, 2013). "Tech Companies Are Doing It Wrong: Cisco Co-Founder". CNBC. Retrieved September 23, 2015. ^ a b c d e f Carey, Pete. "A start-up's true tale". San Jose Mercury News. Retrieved July 26, 2012. ^ "Cisco's Acquisition Strategy". Case Studies in Business Strategy. ICMR. IV: 2. January 2004. BSTR083. Retrieved December 21, 2009. ^ "Former Cisco CEO John Morgridge to Give 2012 GSB Graduation Address". Stanford Graduate School of Business. Retrieved November 27, 2018. ^ Leung, Wendy (May 27, 2012). "Happy 75th Birthday to our Golden Gate Bridge!". Retrieved March 26, 2014. ^ "Does Pink Make You Puke?". Forbes. August 25, 1997. Retrieved June 28, 2011. ^ "I, Cringely. NerdTV. Transcript | PBS". Pbs.org. Retrieved November 13, 2008. ^ Pennell, Ian (June 14, 2004). "The Evolution of Access Routing; Cisco claim of first multi-protocol router" (Interview). Cisco. Archived from the original on July 7, 2007. Retrieved January 4, 2009. ^ Fisher, Lawrence M. "COMPANY NEWS; Cisco to Buy Major Maker Of Switches". Retrieved November 27, 2018. ^ News, Bloomberg. "COMPANY NEWS; CISCO SYSTEMS AGREES TO BUY GRAND JUNCTION NETWORKS". Retrieved November 27, 2018. ^ "Cisco Systems closes $97 million acquisition of Crescendo Communications". UPI. Retrieved November 27, 2018. ^ "Cisco, Form PRE 14A, Filing Date Sep 19, 1995". secdatabase.com. Retrieved March 25, 2013. ^ "Cisco replaces Microsoft as world's most valuable company". The Indian Express. India. Reuters. March 25, 2000. Retrieved January 25, 2007. ^ Cisco Systems Summary. Finance.yahoo.com. Retrieved November 26, 2011. ^ Fost, Dan (May 5, 2006). "Chron 200 Market capitalization". San Francisco Chronicle. Retrieved January 25, 2007. ^ Stephen Lawson, InfoWorld. "Cisco's CRS-1 router reaches five-year milestone." May 27, 2009. Retrieved July 10, 2018. ^ "Welcome to the Human Network" (PDF). Cisco Systems. 2006. Retrieved February 12, 2014. ^ Segal, Adam (January 10, 2011). "Chapter 8 – Promoting Innovation at Home". Advantage: How American Innovation Can Overcome the Asian Challenge. W. W. Norton. p. 191. ISBN 978-0-393-06878-8. ^ Vance, Ashlee. "Cisco Buys Starent Networks for $2.9 Billion". Retrieved November 27, 2018. ^ Svensson, Peter. Cisco to cut costs and jobs as profit stalls. May 12, 2011. Christian Science Monitor. Accessed August 2, 2012. ^ Vance, Ashlee. (July 12, 2011) Cisco said to Plan Cutting Up to 10,000 Jobs to Buoy Profit. Bloomberg. Retrieved September 10, 2011. ^ "Cisco CEO: We Were Fat". Retrieved January 5, 2016. ^ "Cisco Receives EU Approval to Acquires NDS". BrightWire. ^ "Cisco Sells Linksys Home Router Unit to Belkin". Bloomberg. ^ Worldwide. "Cisco Announces Agreement to Acquire Sourcefire Inc. – Cisco Systems". Cisco.com. Retrieved July 24, 2013. ^ "Cisco to cut 4,000 jobs". CNN Money. Retrieved August 14, 2013. ^ Stephen Lawson (November 13, 2013). "Cisco issues grim forecast after falling short on revenue". PCWorld. Retrieved January 5, 2016. ^ "Cisco Investments Allocates $150 Million to Fund Early-Stage Firms Around the Globe". Retrieved November 27, 2018. ^ "Cisco to lay off 6,000 workers in second restructuring". San Jose News.Net. August 13, 2014. Retrieved August 14, 2014. ^ Joseph F. Kovar (November 4, 2014). "Cisco, Intel Invest In Hyper-Converged Infrastructure Player Stratoscale". Crn.com. Retrieved January 3, 2016. ^ "Cisco's Chambers to step down as CEO, to be executive chairman". Reuters. May 4, 2015. Retrieved May 4, 2015. ^ "Technicolor to Buy Cisco's Set-Top Box Unit for About $600 Million". The Wall Street Journal. July 22, 2015. Retrieved July 25, 2015. ^ Janakiram, MSV (April 18, 2016). "Is Fog Computing the Next Big Thing in the Internet of Things". Forbes Magazine. Retrieved April 18, 2016. ^ Jim Duffy, Network World. “Cisco puts its money where the WAN is.” January 14, 2016. January 18, 2016. ^ By Eamon McCarthy Earls, TechTarget. “Cisco opens Umbrella, a cloud-based secure internet gateway.” February 16, 2017. February 17, 2017. ^ “.” November 16, 2017. November 16, 2017. ^ "EX-99.1". Sec.gov. Retrieved August 13, 2018. ^ Julie Bort (September 18, 2017). "John Chambers resigns as Cisco chairman, hints at a 'next chapter'". Business Insider. Retrieved August 13, 2018. ^ "Chambers notifies @Cisco board he won't stand for re-election | The Network | The Network". Newsroom.cisco.com. Retrieved August 13, 2018. ^ "Factbox: U.S. companies with exposure to Russia". Reuters. August 9, 2018. ^ "U.S. companies with exposure to Russia". Reuters. April 13, 2018. ^ Editorial, Reuters. "BRIEF-Cisco Says Will Acquire Accompany For $270 Million In Cash". U.S. Retrieved May 21, 2018. ^ "Cisco Systems on the Forbes Global 2000 List". Forbes. Retrieved June 27, 2018. ^ a b c "2002 Annual Report" (PDF). ^ a b c "2005 Annual Report" (PDF). ^ Last10K.com. "CISCO SYSTEMS, INC. (CSCO) 10K Annual Reports & 10Q SEC Filings". last10k.com. Retrieved November 18, 2018. ^ Garza, George (January 9, 2011). "The History of Cisco". Retrieved January 28, 2011. ^ "Cisco, Form 8-K, Current Report, Filing Date Apr 26, 1996". secdatabase.com. Retrieved March 25, 2013. ^ "Cisco, Form 8-K, Current Report, Filing Date Aug 26, 1999". secdatabase.com. Retrieved March 25, 2013. ^ "Cisco, Form 10-Q, Quarterly Report, Filing Date Nov 23, 2005" (PDF). secdatabase.com. Retrieved March 25, 2013. ^ "KPMG & Cisco". August 8, 1999. ^ Hochmuth, Phil. "Cisco nets Airespace for $450 million". Network World. Retrieved March 17, 2016. ^ "Cisco Announces Agreement to Acquire IronPort". News release. Cisco. January 4, 2007. Retrieved November 8, 2013. ^ Keith Regan (January 4, 2007). "Cisco buys IronPort for $830 Million". E-Commerce Times. Retrieved November 8, 2013. ^ "Cisco launches Self-Defending Network v3.0". News release. Cisco Systems. June 25, 2007. Retrieved November 8, 2013. ^ "About". Cisco IronPort. Accessed November 8, 2013. ^ Patrick Ogenstad (October 6, 2009). "What is Cisco SensorBase?". Retrieved November 8, 2013. ^ "Cisco, Form 8-K, Current Report, Filing Date Mar 15, 2012". secdatabase.com. Retrieved March 25, 2013. ^ "Cisco to Acquire NDS for $5Bn". ^ "Cisco India Overview". Cisco. Retrieved April 14, 2013. ^ "Cisco, Form 8-K, Current Report, Filing Date Oct 14, 2009". secdatabase.com. Retrieved March 25, 2013. ^ By Jim Duffy, NetworkWorld. "Cisco Buys Moto—no, not that Moto Archived 2011-06-14 at the Wayback Machine." May 18, 2010. ^ "Cisco Completes Acquisition Of Pari Networks (Started By Former Cisco Execs)". TechCrunch. March 1, 2011. ^ "Cisco, Form 8-K, Current Report, Filing Date Oct 5, 2009". secdatabase.com. Retrieved March 25, 2013. ^ "Alcatel-Lucent, Huawei continue tight race for leadership in optical network hardware market". Infonetics Research. May 17, 2010. Retrieved September 5, 2011. ^ "Cisco, Form 10-Q, Quarterly Report, Filing Date Nov 18, 2009" (PDF). secdatabase.com. Retrieved March 25, 2013. ^ Ulanoff, Lance (April 6, 2011). "Cisco's UMI Adventure Should End". PCMag. Retrieved September 5, 2011. ^ "Cisco, Form 10-Q, Quarterly Report, Filing Date Feb 19, 2013" (PDF). secdatabase.com. Retrieved March 25, 2013. ^ Reuters (January 23, 2013). "Cisco to buy Israel-based software maker for $475 million". Reuters. ^ Goddard, Timothy. "Corum Group International Advises SolveDirect in Acquisition". PRWeb. ^ "Acquisitions". Retrieved October 7, 2013. ^ "Cisco Has Acquired ThreatGRID". Cisco. Retrieved August 11, 2014. ^ "Cisco Announces Intent to Acquire Tail-f Systems". June 17, 2014. ^ By Liam Tung, ZDNet. “Cisco to buy Embrane to boost datacenter SDN play.” April 2, 2015. April 7, 2015. ^ Diggz, Johnny. "Tropo joins Cisco to Power next-gen collaboration APIs". Acquisition Summary. Tropo. ^ "Cisco Announces Intent to Acquire OpenDNS". Retrieved October 12, 2015. ^ "Cisco Completes MaintenanceNet Acquisition". Cisco. Retrieved October 12, 2015. ^ "Cisco has Acquired Pawaa". Cisco. Retrieved October 12, 2015. ^ "Acquisitions". Acquisition Summary. Cisco. ^ "Cisco Announces Intent to Acquire ParStream". blogs@Cisco – Cisco Blogs. Retrieved October 27, 2015. ^ Lunden, Ingrid. "Cisco Beefs Up Security, Buys Lancope For $453M". TechCrunch. Retrieved October 27, 2015. ^ Leichman, Abigail Klein; Blum, Brian (January 21, 2018). "Cisco to pay $293 million for Israeli-founded CloudLock". Israel21c. Retrieved January 21, 2018. ^ "Cisco cracks open wallet for $293m CloudLock acquisition | Business Cloud News". Retrieved July 26, 2016. ^ Mark Haranas, CRN. “Sources: Cisco Close To Making Bid TO Buy Springpath.” August 4, 2016. August 8, 2016. ^ Lynley, Matthew. "Cisco snaps up AppDynamics for $3.7B right before its IPO". TechCrunch. Retrieved January 25, 2017. ^ Alison, Homes. "Cisco Founds Innovation Alliance With Eleven Partners In Germany". Pressat. Retrieved January 26, 2017. ^ "Cloud-first SD-WAN solution offers flexibility and simplicity to enterprises and telecom carriers". ^ Charlie Osborne, ZDNet. "Cisco to acquire BroadSoft in $1.9 billion deal." October 23, 2017. Retrieved February 7, 2018. ^ "Cisco Systems, Inc. Ownership Summary". Nasdaq.com. July 17, 2018. Retrieved August 13, 2018. ^ "Products & Services". Cisco. Retrieved 2019-04-02. ^ "CCIE Security Cisco Certified Internetwork Expert". ^ "Cisco Launches Hosted Collaboration Solution". UCStrategies.com. July 2, 2010. ^ a b "Cisco Tactical Operations (TacOps)". Cisco. Retrieved July 26, 2016. ^ "Cisco Network Emergency Response Vehicle". YouTube. Retrieved July 24, 2013. ^ "TACOPS — Emergency Response Vehicle Tour, learningatcisco on USTREAM. Conference". Ustream.tv. Archived from the original on January 4, 2014. Retrieved July 24, 2013. ^ 49 Days Later, Superstorm Sandy Relief Effort is Still Running on Cisco Technology. Cisco.com Retrieved January 15, 2013. ^ Cisco NERV: The ultimate first responder vehicle. TechRepublic. Retrieved September 10, 2011. ^ "Cisco TacOps". YouTube. June 28, 2011. Retrieved July 24, 2013. ^ 2011 Innovative Preparedness—Cisco Tactical Operations. Youtube.com. Retrieved September 10, 2011. ^ "Cisco Certification and Career Paths". ^ "Cisco Expands Commitment to Myanmar". ^ Cisco on TV & in the Movies—About Cisco. Cisco Systems (May 15, 2008). Retrieved September 10, 2011. ^ Perlroth, Nicole. "Q and A With 'Something Ventured' Producer Paul Holland". Forbes. Retrieved December 10, 2018. ^ Highbeam Research website Presidential Award For Corporate Leadership Presented to Cisco Systems[dead link]. Retrieved April 10, 2011. ^ Cisco News website Cisco Systems Receives Presidential Award for Corporate Leadership Archived February 20, 2011, at the Wayback Machine. Retrieved April 10, 2011. ^ 100 Best Companies to Work For 2011: Cisco—CSCO. CNN. (February 7, 2011). Retrieved September 10, 2011. ^ David Braue (January 6, 2016). "Australia is world's fourth-largest holder of network-security patents, analysis finds". Retrieved January 5, 2016. ^ "Cisco Shareholder Class Action Lawsuit Resolved" (Press release). Cisco Systems, Inc. August 18, 2006. Retrieved January 25, 2007. ^ "Cisco resolves class action lawsuit". Silicon Valley/San Jose Business Journal. August 18, 2006. Retrieved January 25, 2007. ^ "Free Software Foundation Files Suit Against Cisco For GPL Violations" (Press release). BOSTON, Massachusetts: Free Software Foundation. December 11, 2008. Retrieved January 4, 2009. ^ "FSF Settles Suit Against Cisco" (Press release). Free Software Foundation. May 20, 2009. Retrieved May 20, 2009. ^ "FRONTLINE: the tank man: the struggle to control information | PBS". Pbs.org. Retrieved November 13, 2008. ^ Earnhardt, John (February 15, 2006). "Cisco Testimony Before House International Relations Subcommittee". Cisco Systems, Inc. Archived from the original on December 6, 2006. Retrieved January 25, 2007. ^ Stirland, Sarah (May 20, 2008). "Cisco Leak: 'Great Firewall' of China Was a Chance to Sell More Routers". Wired. Retrieved June 27, 2009. ^ "Doe I et al v. Cisco Systems, Inc. et al". Justia Dockets & Filings. ^ EDWARD J. DAVILA, District Judge. "DOE I v. CISCO SYSTEMS, INC". ^ "Doe I, et al v. Cisco Systems, Inc., et al :: Court of Appeals for the Ninth Circuit :: Case No. 15-16909". ^ "Cisco offices raided, executives arrested in Brazil: reports". NetworkWorld. October 16, 2007. Retrieved October 16, 2007. ^ "Brazilian tax authorities raid, close Cisco System's offices in São Paulo, Rio de Janeiro". International Herald Tribune (Press release). October 17, 2007. Retrieved October 17, 2007. ^ "Multiven Sues Cisco". lightreading. December 1, 2008. Retrieved December 2, 2008. ^ "Net maintenance provider sues Cisco over allegedly monopolistic SMARTnet". NetworkWorld. December 1, 2008. Retrieved December 2, 2008. ^ "Cisco Accused Of Monopoly In Antitrust Lawsuit". ChannelWeb. December 2, 2008. Archived from the original on December 4, 2008. Retrieved December 2, 2008. ^ "Multiven Files Antitrust Lawsuit Against Cisco Systems, Inc" (Press release). Multiven, Inc. December 1, 2008. Archived from the original on January 6, 2009. Retrieved December 1, 2008. ^ "Cisco Systems hit with antitrust lawsuit". SearchITChannel. December 4, 2008. Retrieved December 4, 2008. ^ "Lawsuit: Cisco blocks outsider gear maintenance". fiercetelecom. December 3, 2008. Retrieved December 3, 2008. ^ Stephen Lawson (August 2, 2010). "Cisco settles antitrust suit over software updates". Computerworld. ^ Rik Myslewski (June 3, 2011). "Judge blasts Cisco's 'unmitigated gall' in ex-exec's arrest". The Channel. ^ "Cisco Pushing 'Cloud Connect' Router Firmware, Allows Web History Tracking". Slashdot. Retrieved December 26, 2013. ^ "Cisco's cloud vision: Mandatory, monetized and killed at their discretion". Extreme Tech. Retrieved December 26, 2013. ^ "Interactive graphics: the spy tools of the NSA are sitting here". Der Spiegel. Retrieved January 11, 2014. ^ "Comment on Der Spiegel articles about NSA TAO Organization". Cisco.com. Retrieved December 29, 2013. ^ "NSA "upgrade" factory show Cisco router getting implant". ^ "Customer Recommendations: Securing Your Network". Cisco.com. Retrieved January 25, 2017. ^ "Internet Security Necessary for Global Technology Economy". Cisco.com. Retrieved May 13, 2014. ^ "In Letter to Obama, Cisco CEO Complains About NSA Allegations". Re/Code. Retrieved May 18, 2014. ^ Jeffrey Burt (March 27, 2014). "Cisco Sued for Infringement of Old Nortel Patents". eweek. ^ Behar, Richard (July 24, 2013). "Peace Through Profits? Inside The Secret Tech Ventures That Are Reshaping The Israeli-Arab-Palestinian World". Forbes. Retrieved July 25, 2018. Bunnell, D. & Brate, A. (2001). Die Cisco Story (in German). Moderne Industrie. ISBN 3-478-35995-3. Bunnell, D. (2000). Making the Cisco Connection: The Story Behind the Real Internet Superpower. Wiley. ISBN 0-471-35711-1. Paulson, E. (2001). Inside Cisco: The Real Story of Sustained M&A Growth. Wiley. ISBN 0-471-41425-5. Slater, R. (2003). The Eye of the Storm: How John Chambers Steered Cisco Through the Technology Collapse. HarperCollins. ISBN 0-06-018887-1. Stauffer, D. (2001). Nothing but Net Business the Cisco Way. Wiley. ISBN 1-84112-087-1. Waters, J. K. (2002). John Chambers and the Cisco Way: Navigating Through Volatility. Wiley. ISBN 0-471-00833-8. Young, J. S. (2001). Cisco Unauthorized: Inside the High-Stakes Race to Own the Future. Prima Lifestyles. ISBN 0-7615-2775-3. Wikimedia Commons has media related to Cisco.